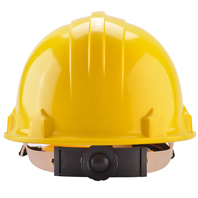 Safety helmets are a type of headgear which are worn by workers who are engaged in industrial or construction sites in order to protect the head from injuries which are caused by falling objects, debris, rain, electric shock etc. People who are involved in industries such as real estate, petrochemicals and logistics are exposed to these dangers on a regular basis. The safety helmets that are used in factory settings these days come with a brushed cloth on foam and cross ventilation systems. The triple configuration shells of the helmets ensure that they have a high impact resistant capacity. Created from specially formulated polymers, they can be used for years together. What Are the Different Types of Safety Helmets? A person’s brain can be seriously injured by impact or through the head’s violent rotation of the head while the brain remains still, causing a jerk to nerves and blood vessels. Internal blood vessels and nerves jerk various parts of the brain as well, thereby causing a lot of strain to vessels and nerves. Safety helmets are designed in order to handle major crash energy which contains a crushable foam layer. Once the user crashes and hits a hard surface, that part of the helmet crushes, checking the crash energy and extending the wearer’s head’s stopping time by around six thousandths of a second (6 ms) to minimise peak impact to the brain. Internal strains and rotational forces are likely to be minimised by crushing. Safety helmets are usually of three types- Class A, Class B, and Class C.
Class A helmets offer users with impact and penetration resistance apart from limited voltage protection (up to 2200 volts). Class B helmets offer the best quality of protection against electrical hazards with high-voltage shock and burn protection. They also protect users from impact and penetration hazards caused by flying/falling objects. Nape Helmets- The inner shell of this type of helmets is normally made from plastic. 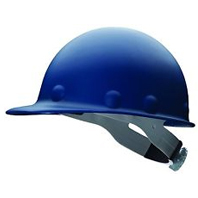 These helmets are often used in mines and are equipped with a comfortable strap. They have a bright, shining surface. Ratchet Helmets- The head band of these helmets is created from soft, on irritant fabric to offer a high level of comfort to the user. Universal adjustment is ensured by the adjustable chin strap. The shell’s triple corrugation guarantees a high level of impact resistance. Without Ratchet Helmets-These helmets are electrically insulated as per EN50365 for working in low voltage environments. They are ideal for use in temperatures which range from -30℃ to +150℃. Safety Helmet, Explorer I- Created from UV-resistant ABS material, this helmet has good absorption and can resist high impact. 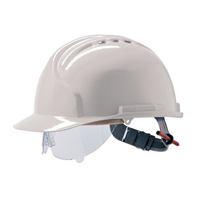 This safety helmet is mainly available in ratchet adjustment, tape and plastic suspension lining harness. You can detach the harness easily. The helmet fits users with the head size between 53 cm and 66 cm. Industrial Helmet- These helmets come with a slide lock system which makes them easy to use. Safety Helmet, HM2- These type of safety helmets are light, comfortable and offer users with a satisfactory quality of ventilation. Their hard shell has been created UV-resistant ABS or HDPE materials which are good absorbers and resists high impact effectively. 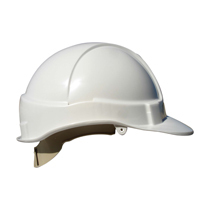 Fibre Glass Safety Helmet- The safety helmets of this type offer wearers with a high level of comfort and functionality. They keep the wearer’s head safe from direct impact and penetration caused by falling or flying objects. Where Are Safety Helmets Used? How to Select Safety Helmets? At industrial settings in which there are risks related to electric shocks, helmets with dielectric strength. The labelling on helmets in these cases will be 440Vac. In industrial setting where workers are vulnerable to the impact of melted metal fragments, helmets which are resistant to such an impact will be used. The labelling on the helmet will be MM. In areas where there are risks of lateral deformation of the head, helmets with LD labelling which are resistant to this hazard need to be used. In areas where workers need to put in a lot of physical effort at high ambient temperature, leading to excessive sweating, workers need to use a helmet with good ventilation. At workplaces that are exposed to the dangers of explosions, helmets with anti- electrostatic properties need to be used. Helmets which are either too large or too small in size are not ideal for industrial use. They need to fit the head size of the user properly. Majority of the protective headgear which you will come across are available in different sizes with adjustable headbands to make ensure a comfortable fitting. A helmet with a proper fitting will let ample clearance between the suspension system and shell for impact distribution and ventilation. The helmet should bind, slip, fall off or cause skin irritation. Some types of protective headgear enable industrial workers to utilise different accessories like safety glasses, earmuffs and face shields to help employees deal with changing weather conditions. A number of helmets also include channels that draw rainwater away from the face. How to Maintain Safety Helmets? A helmet’s durability can be extended through periodic cleaning and inspection. You need to check the shell, suspension system and other parts of your helmet for holes, cracks, tears or other types of damages which can have a serious impact on the hat’s protective value. Paints and cleaning agents might weaken the shell of your helmet and also cause the elimination of electrical resistance. One wise thing that you can do is to get in touch with the helmet manufacturer to acquire details on the effects of paint and cleaning materials on their products. Avoid drilling holes, applying labels or paints to protective headgear since this will have a negative impact on their protection. The helmet should also be kept away from direct sunlight as sunlight and extreme heat can cause considerable damage. In case the helmet which you have been using has problems such as cracking, perforation or deformity in its shell or brim the you will need to replace them. Why Buy Safety Helmets from Moglix? 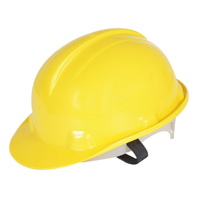 At Moglix, we deal in all types of safety helmets online that are used across industries such as real estate, oil & gas, logistics, steel, iron, metallurgy, constructions, petrochemicals etc. We have created a vast supplier base across India and overseas to cater to the needs of our buyers who include both business owners as well as industrial workers. The products which we are offering in this range have been sourced from brands such as Karam, 3M, Safari Pro, Safari etc. The price of the safety helmets has been kept within a wide range to suit the budget of our buyers who come from different backgrounds. 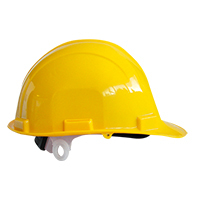 These helmets are available in different sizes and colours to meet the needs of our customer base. 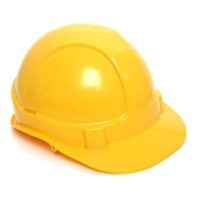 We also deal in safety shoes, safety jackets, hearing protections, fall protection, safety goggles, safety gloves etc. as a part of our safety category which are also essential for industrial use. The helmets that we have on offer are available with lucrative discounts. Boost your safety todays with safety helmets from Moglix!